Discussion in 'Tips/Tricks/Mods' started by Germanius, Jan 15, 2011. Off/on means that you can choose if you want to turn it off or on. This module comes with a documentation/manual (english), which has 5 pages. There you will find installation instructions, explanatory notes, general information about all features and the perspective of the module concerning ISPConfig 3. Additionally you will find some code for your registrant module. All further updates, bugfixes, new features and changes in ISPConfig 3 are included. If you have questions, please contact me (PM - personal message). What about future updates, are they included in the 30 euro price? Just to warn people, this module comes with a custom version of the remoting API (php files) for ISPConfig, which could pose issues with upgrades. Germanius, can you confirm that features requests have been raised for each of the changes you've made to the remoting.inc.php and remote_user.tform.php files? If so, can you post the links on here so we can all vote? As described in the documentation, the changes in the remotingfiles get overwritten, if you update ISPC. But you simply have to replace them again, then it is working again. The changes I did in the remotingframework are already trasmitted to Till. He said, that he will include them in the stable SVN, so probably in the next ISPC version you dont have to change any remoting files. I can confirm Germanius sayings about the remote framework. Till and I updated the remote framework on the svn. The missing functions will be in the next ISPConfig version. The only thing I have as a question is what to do with this. It's unclear what to change and where? the end (if you have such a function). That is optional. If you have the possibility to add custom code to your registrar module (if you already use one!! 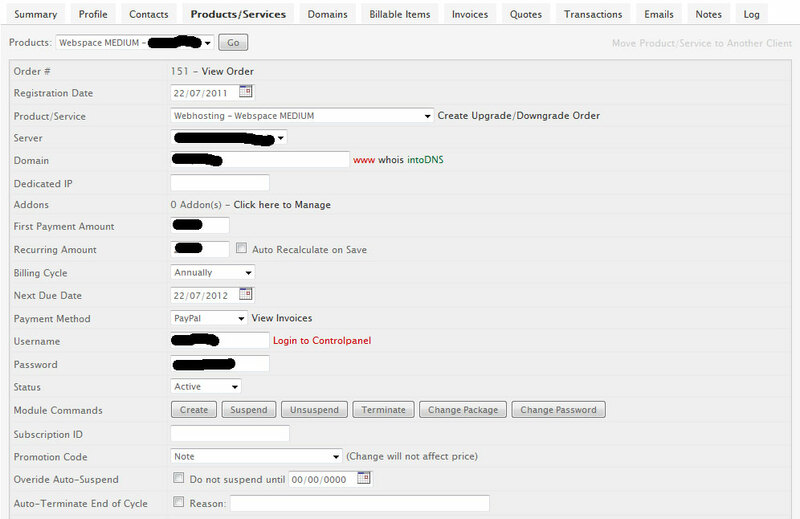 ), then you can add the code to the existing function of your registrar module. But then you have to deactivate the domaintool function in the module, because these tasks are then done by the registrar module. In this case EVERY registered domain is added in ISPC, not only the one they got with the hostingpackage! Edit: Okay, I see. I will improve the manual in the next version concerning this. I think we should raise a Feature Request in the bug tracker to show Client Template ID & Server ID in the lists. If not, the only way to be sure you've got the right ID's would be to look in the database. and how does that relate to ISPConfig Server ID? I assume Server ID is the field that specifies which Web Server to setup the site on, or is this the one with the Control Panel on? We are currently testing the new version 1.0.1, where those settings (serverid and defaultid's) are a little bit clearer, because of Servermanagement in WHMCS. I will describe that in detail in the new manual, which will be released with the 1.0.1 in a few days. When I create a new website Apache stops and can't be restarted I get this error. I deleted the /etc/apache2/sites-enabled/ghghghghghghgh.nl.vhost file and thand Apache restarts without problems. Did you set up the right IP in the module settings and is this IP already set uped in ISPconfig, so that you can crwate websites with that IP? I added the correct IP address now. I re-created the website again via whmcs but now all my sites give a 403 Forbidden error. I restarted Apache, and the 403 error is gone. I started with enabling the domain-module enabled in ISPC3. 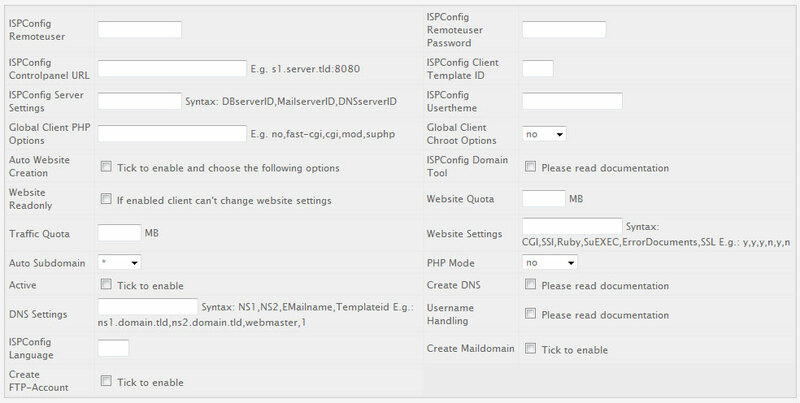 Via System, Edit user, choose admin, and enable the module "domain". You have to logout and login again. You will have an extra navigation icon (domains). I also did not have an IP address added in ISPC3. Changed all website from * to the IP address. If you changed the first website to a IP, all others will not work anymore. But don't worry, go on changing every site. All sites you changed will work. Thanks to Germanius for his help (via DM). I am thinking about buying WHMCS to use this module. Can someone thats using it tell me that it does indeed work.